Another casualty of the parochial re-ordering, St Martin was closed in 1971. Initially it was used as the store for the Diocesan Furnishings Officer (re-homing unneeded church furniture). In 1987 it was taken over by the Probation Service (and later its various successors) – it is conveniently close to the Law Courts. This resulted in the most interesting alteration in any church. 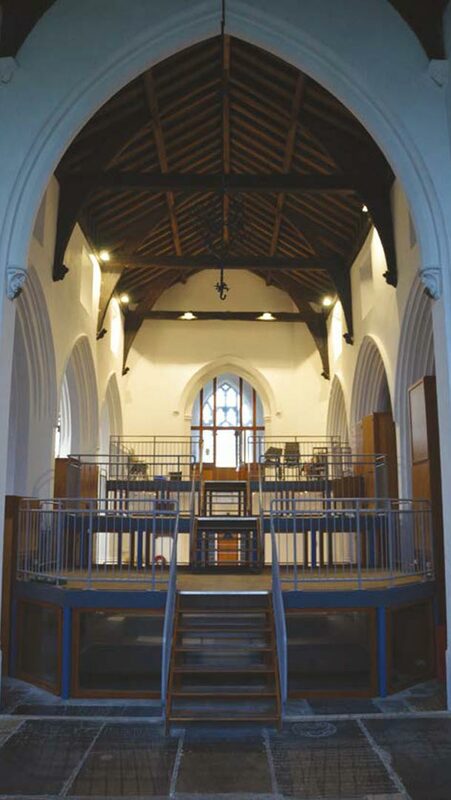 Besides screening in the two chancel chapels for use as meeting-rooms, and inserting a mezzanine floor in the north aisle, a three-tier structure has been inserted in the nave which gradually increases in height, rather than a simple mezzanine. Below, it has been excavated on two descending levels (which provided an opportunity for an archæological investigation). The whole arrangement provides a number of communicating but discrete spaces. Other improvements include restoring the north aisle roof in 2007. MoveOn East, the latest successor of the Probation Service, vacated the building in 2012. It then stood empty until 2017, when the Trust itself decided to move its base of operations there. This will provide us with an identifiable base in the city, in which a variety of activities can be housed, including a visitors’ centre, as well as the Trust’s administrative offices.